Released 3 November 2003, and achieved at least 3 times Platinum status. Length 81 minutes (disc 1) and 144 minutes (disc 2). The DVD comes in a standard plastic case with the head design from 'The Miracle'. In the UK only, for the first three months of release, it was available in an outer card slipcase, with the 'I Want To Break Free' group photo. 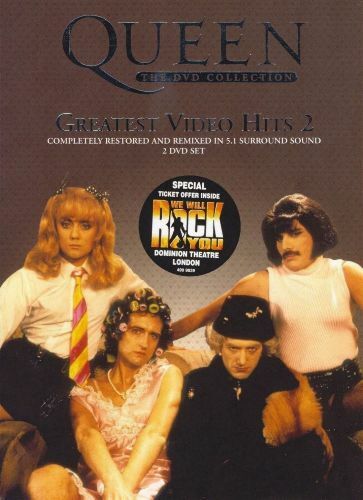 Whilst this is essentially a DVD reissue of 'Greatest Flix II', it loses the four tracks from 'Innuendo', but adds a number of bonus videos and additional material. Both discs also feature a single hidden track which is not mentioned anywhere on the menus or packaging. All videos feature an introductory screen, which shows the single sleeve against a black background. Both discs feature an edit of 'God Save The Queen' as the menu loads, whilst the menus themselves use 'magic noises' from 'A Kind Of Magic'. All of the videos on the first DVD are available in stereo, surround sound, or with audio commentary by Brian and Roger. The menus feature animations based on 'The Miracle' heads, and allows you to play all titles, jump to a specific song, or change the audio setup or subtitles. The song selection is arranged over two screens, which play 'magic noises' from 'A Kind Of Magic', with short excerpts and sound effects from each song over the top. The videos for 'Friends Will Be Friends' and 'A Kind Of Magic' are slightly different to the originally released videos (only at the end), whilst 'Las Palabras De Amor' is the full length version (previously only available as an edited version). Title 6 on disc one is a hidden video of 'Who Wants To Live Forever', which features clips from Highlander. features footage filmed over a 2 week period, whilst Queen were recording the track, and has excerpts using alternative drums, vocals, guitars, bass and keyboards, and includes a Piano Solo and the 'Just For Fun' version of 'One Vision'. Most of the footage was previously available, with interviews over the top, on the 'The Magic Years - Volume I' video. despite what the sleeve notes say, this has been released before, on the 'Queen Rocks' video. The video was also later included on the 'A Kind Of Magic' 2011 iTunes LP. features interviews with designer Richard Grey and paintbox operator Richard Baker, about how the album cover was developed. It also features video excerpts of 'I Want It All', 'Breakthru' and 'The Invisible Man', with audio excerpts of 'One Vision' and 'A Kind Of Magic' (5 minutes). This was later included on 'The Miracle' 2011 iTunes LP. 'Back Chat' and 'Calling All Girls' are available in stereo, surround sound, or audio commentary, while all other content is available in stereo only. The four tracks used on the sub-menus were originally exclusive to the Japanese 'Greatest Karaoke Flix/Hits' CD, VHS and DVD. The disc also features a hidden video of 'Who Wants To Live Forever', released in 1989 for the British Bone Marrow Donor Appeal, which features vocals by Ian Meeson and Belinda Gillett and music by Brian, Roger and John. It is not mentioned anywhere on the disc or packaging and is available as title 13. The sleeve notes also mention a Freddie Mercury interview from 1982 and a David Bowie interview, but these are not present on either disc. 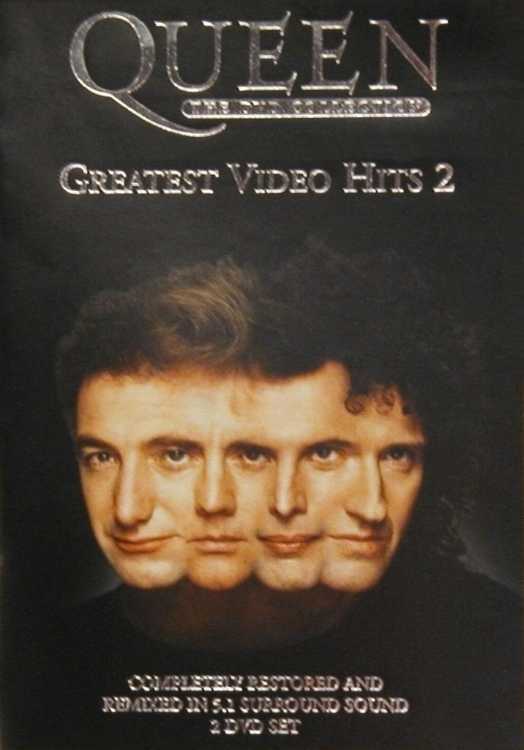 The first disc was later released as part of the 'Greatest Video Hits' release in the USA in 2012, alongside the first disc from 'Greatest Video Hits I'. Although it included the same 17 tracks, it will probably have included a new menu to match the other disc, and to remove any mention of 'Greatest Video Hits II'. This features various separate interviews recorded with all four members of the band in 1984. Length 11:48. Interviewer: Do you think it deprives the listener of some sense of imagination? Interviewer: But, do you still get along with the er, love that Freddie seems to have of drag queens and transvestite and all that, that gets free in the videos? Interviewer: It was Roger's wasn't it? This features various separate interviews recorded with all four members of the band in Spring 1986. Length 12:19. Interviewer: Are you pleased that the new album though is not gonna be a complete soundtrack album? John: We did all the music for the film first, and they dubbed it onto the film, and when we came to do the album, we actually rearranged a lot of the tracks, made them, you know, longer, and you know, wrote more lyrics, and tried to make them into fully fledged songs, so they're um, so they stand up in their own right, er, you know without necessarily having to be with the film, you know you could actually hear them on the radio and they would sound like, you know, songs rather than actually more incidental music. This features various separate interviews recorded with Brian, Roger and John on the set of the 'Breakthru' video in May 1989. Length 8:22. This feature was later included on 'The Miracle' 2011 iTunes LP, titled 'The Making Of The Miracle'. At the very end, the feature includes about a second of Jonathan Ross introducing Queen from the 1989 'Goodbye To The Eighties' programme, possibly a clue to an unused featurette. Interviewer: Did it help you to return to the studios feeling refreshed? This is Freddie's most famous interview, recorded at Musicland Studios, Munich, in early 1984, interviewed by Rudi Dolezal. Length 15:27. Rudi: (Dialogue in German) How does it feel, at the end of a day like that, do you like your job, in the evening like that? Freddie: No, no, I think that's, it's more than music, you know, we're personalities so you talk about more than music, I mean if, if all you talked about was music, depending on if you're a music paper, then you talk about music, but there's more to us than just writing songs, I mean, we do other things and we have characters and er, depends what you talk about, so I don't mind it, you know, and, and of course people ask the same questions, because some, some of the questions are current and they want to know about the same things, so ask me about my solo album then, huh? Rudi: Yeah, what about your solo album? Rudi: Of course it is. Does it sound different? Rudi: Yeah, what, to what music you would strip, what music would you use? Rudi: Announcing a tour like that, if you think of the tour life that's ahead of you, is that a pleasant, um, imagination, or do you hate tour life basically? Freddie: What, the, the touring? Rudi: What's the fresh element now in, in the new tour that you're doing? Freddie: I don't, I don't think Boy George is gonna come and go, I think Boy George is gonna be here for a long while. There always has, I mean there's, there's always people that come up like that and for me you can always tell somebody who's gonna stay, and some, and Boy George is gonna stay. I dunno, what do you think? Rudi: Yes, I think so too, if, but the question is what will he wear in ten years? Rudi: Yeah, antique (unknown dialogue) yep, just a moment. Um, you were also recording something with Michael Jackson that was not released yet, I think the song is even called 'Victory', is that true? Rudi: You haven't finished it yet? Rudi: How would you describe your, yourself as an artist, would you say that you're a very organised person, very spontaneous person, or how would you say? Freddie: When I see myself? (Rudi: yes) Oh dear, I want to tear them all up, I just think um, I actually laugh at myself, but I know that it was something that you had to do, I think someone like Boy George in, in about five or ten years time is gonna look and say 'oh my God, did I really look that? ', but he knows that it was, it was relevant at the time, and it was right, and er, and I think, I don't regret any of the things I did, it's just that I laugh, I mean, what did you look like ten years ago? Rudi: If you look at, at other members of the band, I know it's a, it's a, difficult question, but what do you think every single member does contribute to the special chemistry that, that Queen in the end, is this?